To follow this tutorial you need Node and npm installed on your machine. A basic understanding of TypeScript and Node.js will be helpful. In recent years, sentiment analysis has shifted from analyzing online product reviews to social media texts from Twitter and Facebook. Now with the advent and popularity of chat applications on virtually all web applications around the world, we can use a sentiment analysis tool to add a fun feature that enriches users’ chat experience. 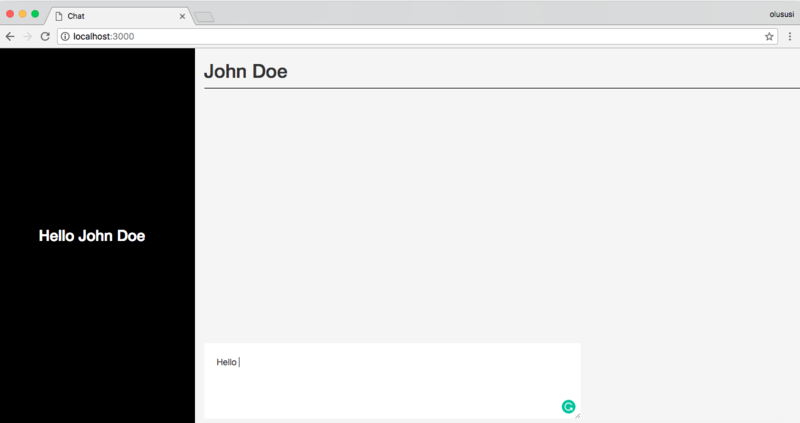 In this post, we will take a dive into a realtime chat demo. 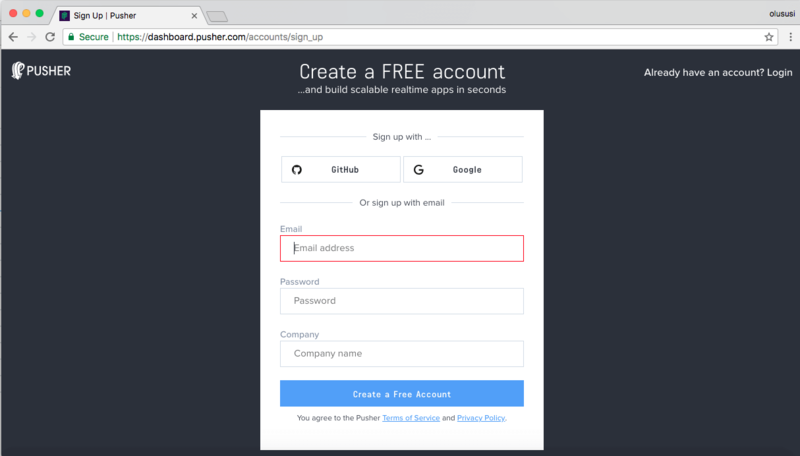 This application will be built using Nest.js and Pusher. Nest.js is a Node.js progressive framework for building efficient and scalable server-side applications. In addition, we will also be able to perform sentiment analysis on messages sent by users. A basic understanding of TypeScript and Node.js will help you get the best out of this tutorial. It is assumed that you already have Node and npm installed. Kindly check Node.js and npm for further instructions and installation steps. The simplest and most efficient way to set up a Nest.js application is to clone the starter repository made available on their website. The command above will start the application on the default port used by Nest.js. Open your browser and navigate to http://localhost:3000. You should see the page with a welcome message like what we have below. Body-parser: a middleware used for extracting the entire body portion of an incoming request stream and expose it on req.body . Under the hood, Nest uses the Express library and therefore, favors the popular MVC pattern. This is the entry point of the application and necessary for bootstrapping Nest.js apps. I have included the Express module, path, and set up ejs as the view engine for the application. On this page, we are simply building a basic chat room that will showcase the realtime functionality and sentiment analysis that was mentioned earlier. This will serve as the homepage for the application, hence the need for it to be well structured. Firstly, we included a link to the Bootstrap CDN file to add some default styling and layout to our application. We also added a custom stylesheet for further styling. We will create this stylesheet in the next section. 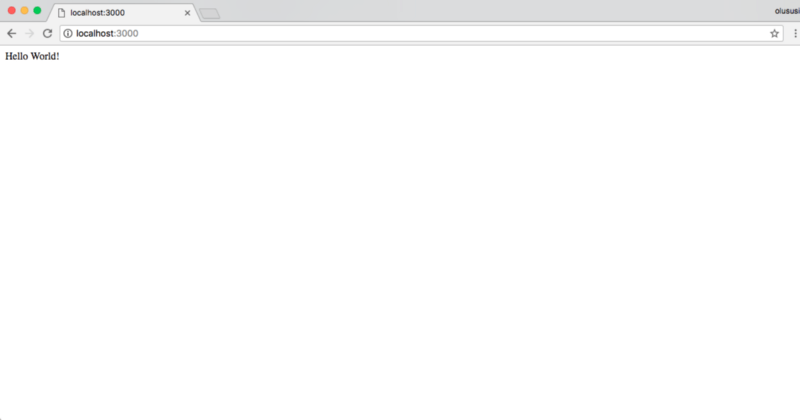 Also included in a <script> tag just before the page title is a CDN file for Vue.js. This is to ensure that Vue.js is loaded immediately the index.ejs file is rendered. Furthermore, on this page, we used an event handler to listen to keyboard events using key modifiers aliases made available by Vue.js. This process will be discussed later in the tutorial. Finally, we included CDN file each for Axios, Pusher and then proceeded to add a custom script file named main.js. To set up this file, go ahead and create a public folder within the src folder in the application and create the main.js file within it. This controller will ensure that Nest maps every / route to index.ejs file. As carefully laid out on our index.ejs page earlier on, the chat room will contain two separate sections that will be differentiated by the width of the column. One of the sections will contain an input field that will accept a username and the other section will be where the chat messages are properly displayed. Here, we created a Vue instance and as part of the options, we bound Vue to a div with an id of app and also passed data options. Further down, we used a method getUser() to retrieve the username of a user. In order to send the chat message to the server, we created a postMessages() function with the responsibility of retrieving the chat message provided by a user and sending it to the server. Earlier, we already configured the app.controller.ts to render the homepage and display the form for consumers. The next thing we need to do is build the controller that will handle the data posted to the server. Create a new folder named chat in the src folder and create a new file called chat.controller.ts within it. As shown above, we imported ChatService and injected it into the controller through the constructor. As recommended by Nest a controller should handle only HTTP requests and abstract any complex logic to a service. As required within the ChatController above, let’s create a component as a service. This will basically receive the posted data object that contains, both the username and chat messages provided by the active user and publish it to a designated channel for the client side to listen and subscribe to. Here we have initialized Pusher with the required credentials in order to be able to trigger an event named new-chat through a channel named chats. We also required Sentiment module, this is important, as it will help us analyze the data messages posted by a user and returned respective scores by cross-checking the words. To make this work, both the ChatController and ChatService needs to be registered within the app.module.ts file. If we try to send a message, nothing will happen for now. This is because we have not updated the chat room with the values of the chat posted from the server. 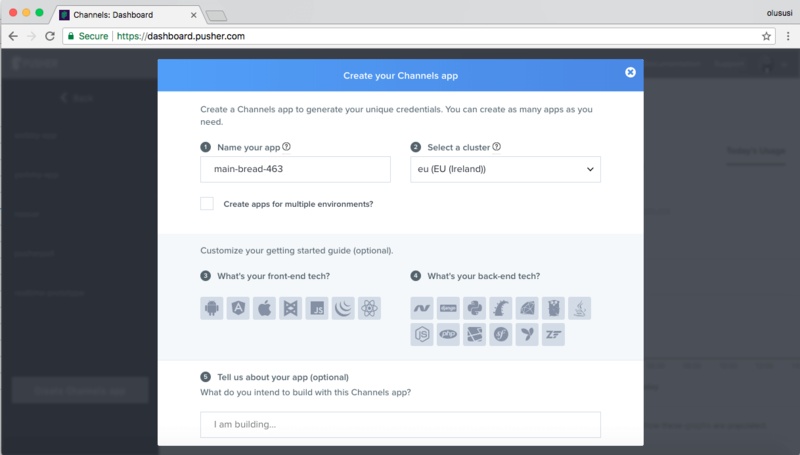 In order to receive the chat messages in realtime, we’ll use the subscribe() method from Pusher to subscribe to the created chats channel. First, we added some constants of code points for a particular sentiment emoji. This will help us rendered an emoji corresponding to the mood of the user during the chat as analyzed by the Sentiment module. 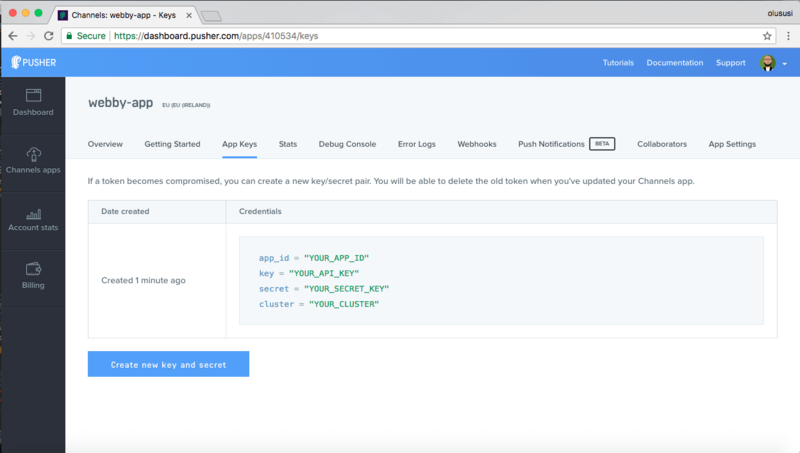 Ensure that you replace the YOUR_API_KEY placeholder with the appropriate credentials as obtained from your user’s dashboard on Pusher. 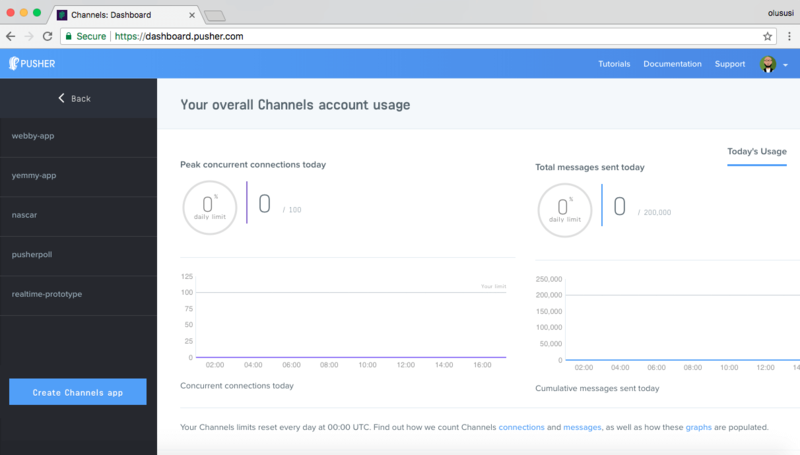 We have been able to build a basic chat application with realtime functionality as powered by Pusher. A lot of improvement can be introduced in order to make this application function much better. Please feel free to explore by checking the source code of this project here on Github.